Major business opportunities are on the horizon for organizations interested in securing the internet of things for customers, and BlackBerry Ltd. is actively looking to benefit from the boom. While he’s unsure how much more people are willing to pay for secure IoT devices, BlackBerry CEO John Chen said he’s confident the firm’s latest move to apply the company’s trusted security software, currently found in smartphones and vehicles, to a broader range of IoT devices, is going to pay off. 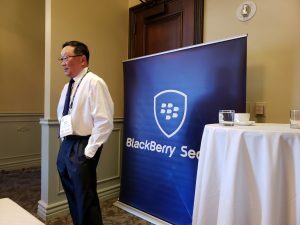 IoT security will get worse before it gets better, BlackBerry CEO John Chen told media at CES 2019. Photo by Alex Coop. “2019 will be the year consumers will begin to vote with their wallets and seek out products that promise a higher level of security and data privacy,” said Alex Thurber, senior vice-president and general manager of mobility solutions at BlackBerry. He notes the feature packs will likely have a profound impact on the industrial IoT space, where a lot of the front-facing parts of a factory, for example, are directly tied to the data centre. BlackBerry’s IoT announcement focuses on the business market, meaning other vendors should be stepping up to the plate to cover the rest of the market, said Sangster, adding the government should also take a hard look at the IoT space and develop a set of standards that emphasize built-in security because of the technology’s rapid insertion into everyday life. According to a 2018 report that surveyed more than 1,250 senior executives, management and security practitioners across the U.S., U.K. and Canada, only 30 per cent of them are confident their business will avoid a major security event in the coming two years. Sixty per cent believe an attack will hit in the next few years. AI and IoT are overtaking cloud as the biggest emerging technology risk. The overall risk posed by cloud over the next three years is expected to drop from 70 to nearly 50 per cent, while risks posed by AI will double and IoT concerns will go up by 30 per cent.